Tortoise Trust Web - Emergency Symptoms! With continuing advancements in medical technology, more people are surviving heart attacks than ever before. There are still far too many, however, who could have been saved, but died because they wasted time getting to a hospital. They felt a loss of breath, pain weighing on their chest or shooting up their arm, but instead of calling an ambulance, they called a couple of friends to get their advice… decided to give it awhile to see what would happen... and what happened was – they died. 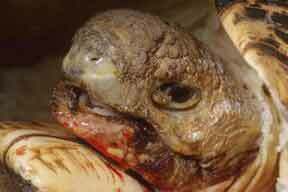 Too many turtles and tortoises die every day for the same reason. 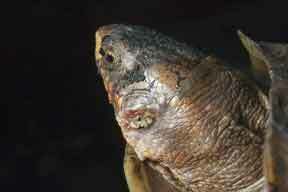 It only takes a browse through any on-line discussion list or message board, and you will find e-mails from people asking questions like, “Does anybody know why my turtle is laying on a rock, wheezing, and too weak to swim?” or “My tortoise has been in an accident, and his carapace is cracked. What should I do?” And in their search for advice, the clock is ticking, and the chances of recovery for a seriously ill animal grows less likely by the minute. I get phone calls, e-mails and, on occasion, even letters. And when I hear the symptoms indicative of critical illness or trauma injury, my answer is immediate – “Get the animal to a specialist vet, without delay”. 1. Wheezing, nasal discharge, labored breathing or breathing with mouth help open (shown above): Possible causes: Respiratory illness, including pneumonia. 2. 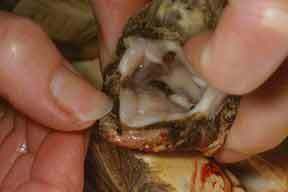 Red flush or bleeding from carapace, plastron or skin. Possible causes: Systemic infection or bacterial or fungal skin infection, or subcutaneous ulcerative infection (‘shell-rot’) as shown above..
3. Swelling, flesh has a puffy appearance. Edema (see above). Possible causes: If arises suddenly, could be related to renal or pulmonary disease. If long-term without other symptoms, may indicate obesity and over-feeding. 5. Weakness, listlessness, unable to walk or swim, poor hind-limb power or responsiveness. Possible causes: These symptoms are indicative of critical illness that could result from numerous underlying conditions including metabolic bone disease, severe nutritional deficiency, egg retention or dystocia, egg–yolk peritonitis, articular gout, septic arthritis, trauma injuries (all of which can be diagnosed using x-rays), serious overheating, pneumonia, or any conditions associated with septicemia. 6. Pale mouth (except in species where this is the normal coloring). Indicates dangerously low red blood count. Possible causes: Severe parasitic infection, internal hemorrhaging, renal or liver disease. 7. Locomotion difficulties or paralysis. Possible causes: Could be symptomatic of renal disease, spinal injury or metabolic bone disease. 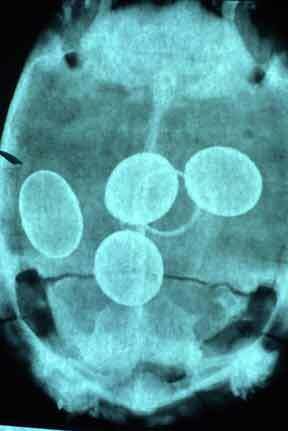 In females suspect egg-retention problem and x-ray to confirm or eliminate. The following are symptomatic of serious conditions that need prompt diagnosis and medical treatment. 1. Rubbing eyes or sides of head with forelegs. 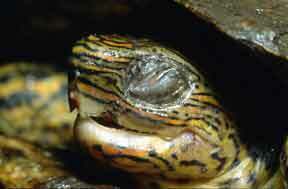 Suspect eye or ear infection (shown below: box turtle with supurating ear abscess). 2. Weight loss, worms seen in stools, or loose stools with mucus, blood, or undigested food. Internal parasites. 3. Difficulty in movement, due to avoiding the use of a limb. Could have localized swelling. Possible broken bone or dislocation. 4. Weight loss, non-specific anorexia. Could be the result of numerous conditions that require proper diagnosis. 5. 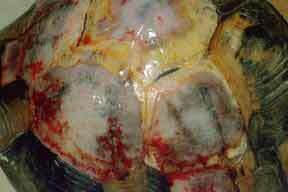 Hatchings failing to thrive, very low growth rate, carapace and plastron do not harden in the normal period of time. Could be due to nutritional deficiencies, parasite problems, possible thyroid-related defect or other genetic abnormality. As you can see, some symptoms may occur with various forms of illness. Swollen eyes are often found in conjunction with an ear abscess, but they can also be the result of a vitamin A deficiency, or a purely local infection. Locomotion difficulties and weakness are symptomatic of any number of serious conditions that could quickly result in the death of an animal. It isn’t surprising that veterinarians themselves avoid making a diagnosis on a verbal description. Certain symptoms may indeed indicate a serious illness, and signal the owner and the vet that the animal needs to be seen immediately, however, to provide an accurate diagnosis and effective treatment; a full and comprehensive evaluation is required. This would include a physical examination, any necessary diagnostic tests, and a review of the diet and husbandry being provided. 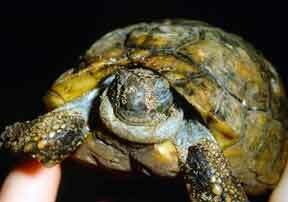 The early warning signs of illness are sometimes quite subtle, and you may also observe a symptom that was not included here, so if you notice anything unusual in your turtle or tortoise’s behavior, appearance or feeding habits that gives you concern, don’t hesitate to call your veterinarian. Remember, early treatment saves lives, both for people - and their pets.